Discover Juneau's dynamic natural scenery and flavors as you embark on a picturesque seaplane ride before savoring an all-you-can-eat Alaskan feast in a cozy lodge. 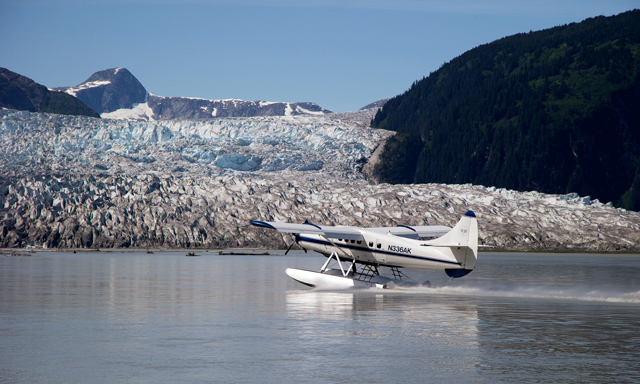 Fly over lush Tongass National Forest and the massive Juneau Icefield, as your guide spots five enormous glaciers from your window seat. Land near Taku Glacier, the world's deepest and thickest, where you'll visit Taku Glacier Lodge for a scrumptious meal of grilled wild Alaskan salmon and plenty of sides. • Commentated Seaplane Ride: See Juneau's spectacular scenery by air, with a window seat and informative headset commentary from your guide. • Alaskan Feast: Relish a tasty, all-you-can-eat meal of fresh wild Alaskan salmon, grilled chicken, and sides at rustic Taku Glacier Lodge. • Scenic Glaciers: View Tongass National Forest and Juneau Icefield, home to Taku, the deepest and thickest glacier in the world. • This tour includes approximately 50 minutes of flight time. • All guests enjoy a window seat on the plane and a headset for narration. • Wildlife sightings are not guaranteed. • Consider dietary restrictions and food allergies when selecting tour. • This tour follows Federal Aviation Administration requirements stating that children 2 years and older on any aircraft must occupy, and pay, a separate seat.